Ice cream is a favorite treat for people of all ages, especially in summer. Easy Homemade Ice Cream provides a quick and easy dessert during any day, especially during the hot and sunny days. 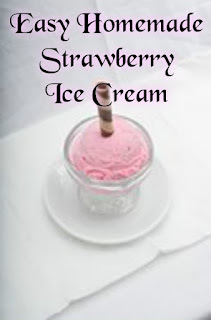 While there are many different flavors of ice cream one flavor that seems to be enjoyed by most is strawberry. Strawberry ice cream can easily be made in just minutes, with hardly any time or effort! 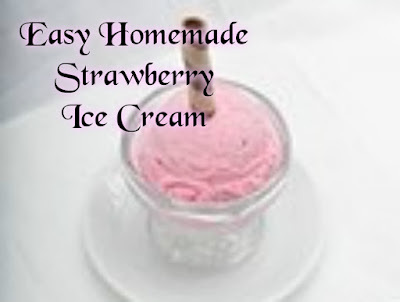 Homemade with fresh strawberries your ice cream will result in a super rich, smooth, and creamy tasting dish! This recipe is very quick and easy to make and consists of minimal and simple ingredients. This recipe is also egg free, does not require any cooking, and made without an ice cream maker. Try making this recipe with your children. They will enjoy putting this yummy frozen treat together and will be so happy with the result. 1. Place a large bowl and whisk attachments of hand mixer in the refrigerator to let chill. 2. Place strawberries into a blender and mix until pureed. 3. Add the sweetened condensed milk and vanilla. Mix until well combined. Pour mixture into a large bowl and set aside. 4. Removed chilled bowl and whisk attachments from refrigerator. Place thick whipping cream into the bowl. Turn hand mixer on medium-high and beat until firm peaks form. 5. Transfer the whipping cream into the strawberry puree mixture and fold in until combined. Do not stir. 6. Pour ice cream into a freezer safe container. Put plastic wrap over the ice cream to prevent air from entering and then tightly attach the lid. Place in freezer for at least 8 hours. Scoop out ice cream into bowls and serve. Enjoy! Have you ever made your own strawberry ice cream at home? I really appreciate homemade ice cream recipes especially during the summer! There are so much fresh produce in the markets and making ice cream out of them is one of the best ways! It's healthier as well. Oh, I can't believe that you can make an ice cream so easy. I will try this. That's actually a lot easier to make than I expected! Perfect for the summer heat. We'll make it this weekend with the kids! OOO!! I'm so going to try this!! It's so hot here nowadays! !